There’s big money on the future of adding something extra to games. Activision knew this when they started the Skylanders franchise, and though it may have had the same intentions, Disney Infinity has managed to become something different in the process. A solid game overall, the Disneyfied toys to life genre gets an upgrade in September that addresses several gameplay issues from the first game. And adds a ton more characters to the shopping list. Over at E3, I got the chance to play as several members of the Avengers and the newly announced Ultimate Spider-Man playset. It feels like your typical Disney Infinity session, but dammit I’m a sucker for comic book characters. What’s genuinely new is how these characters can interact with their world now. Iron Man flies around New York, Captain America is a nimble super-soldier and Spider-Man can web-swing around in a manner that is far more fun than Beenox’s recent tie-in to the Amazing Spider-Man 2 movie. The catch here though, is that much like with other playsets, the Spidey and Avengers universes are sealed off from one another, thus not allowing titanic team-ups. Unless you get your hands on ten Iron Man tokens in the Spidey playset, which will allow the armoured Avenger to join forces with you in a new story-mode, according to the team at Disney Infinity. 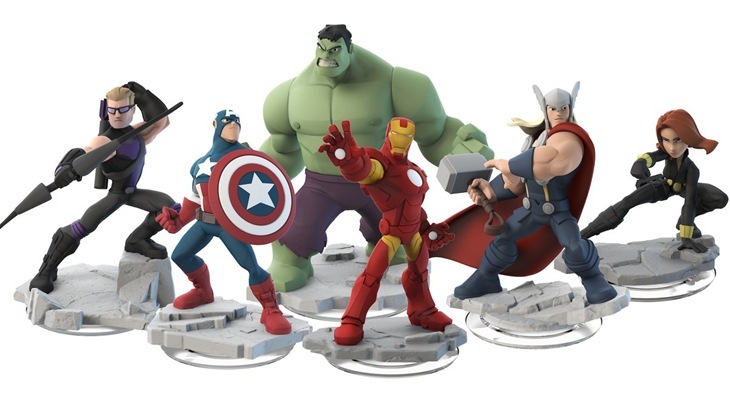 Expect something similar for Spidey with these Avengers, but don’t expect that feature to be implemented in the other playsets either as Disney explained that they wanted to “preserve fans expectations” to me at E3. I still think it’s a bit of a wasted opportunity to not open up worlds to all of the characters, but at least they can still interact with each other in the toy box mode. 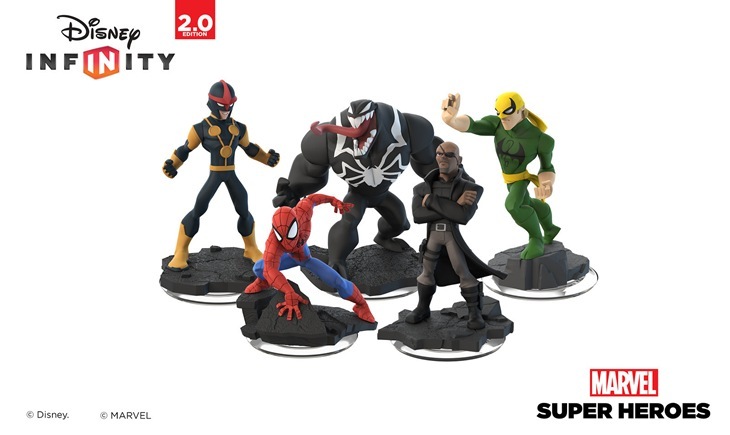 Characters now also share voice actors from their animated counterparts, while the new Nick Fury figure is voiced by none other than Samuel L Motherlovin’ Jackson himself. 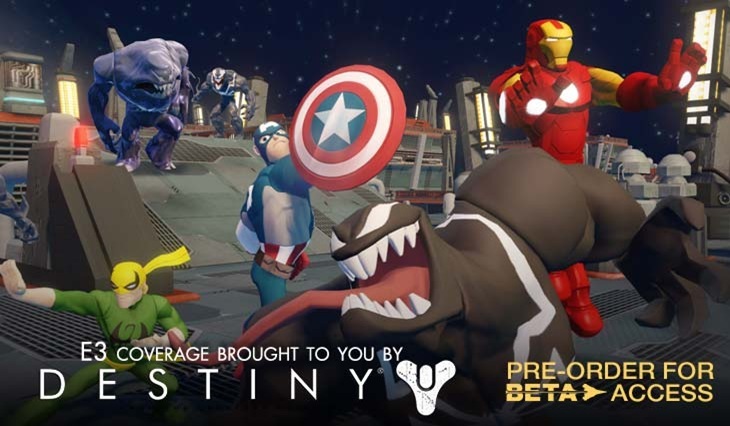 So what else is new in Disney Infinity 2.0? Power Discs are also getting a revamp, with certain collectable discs allowing players to team up with famous Marvel Heroes in combat. In one instance, I was playing as Iron Man and got a timely assist from the former Captain America sidekick Bucky in battle, although you might know him better as the Winter Soldier. Power Discs can also provide a quick change of wardrobe, for all you fans of variant outfits out there. As for story, Disney isn’t ready to spill too many beans yet. For the Ultimate Spider-Man playset, players need to team up with Venom after the lethal symbiote was abducted by the Green Goblin and Mysterio, experimented on and then used to unleash various Venom clones throughout the city. As for The Avengers, nothing has been mentioned yet, although I suspect that that playset will utilise a Loki-centric tale. I quite enjoyed my session with the improved version of Disney Infinity. The single-player now has a more intuitive interface, the new additions are fantastic and the skill tree system works rather well. In the Toybox, the experience has also been streamlined, with new procedural generation tools that help create better levels and templates for all manner of genres. It’s more of the same, but this time it’s better thanks to the various improvements available. When the game launches this year, it’ll do so with a new portal pack, while existing owners can download a digital upgrade to their existing set. And yes, this is going to make me completely broke, especially if they announce a Star Wars add-on for the inevitable Disney Infinity 3.0.